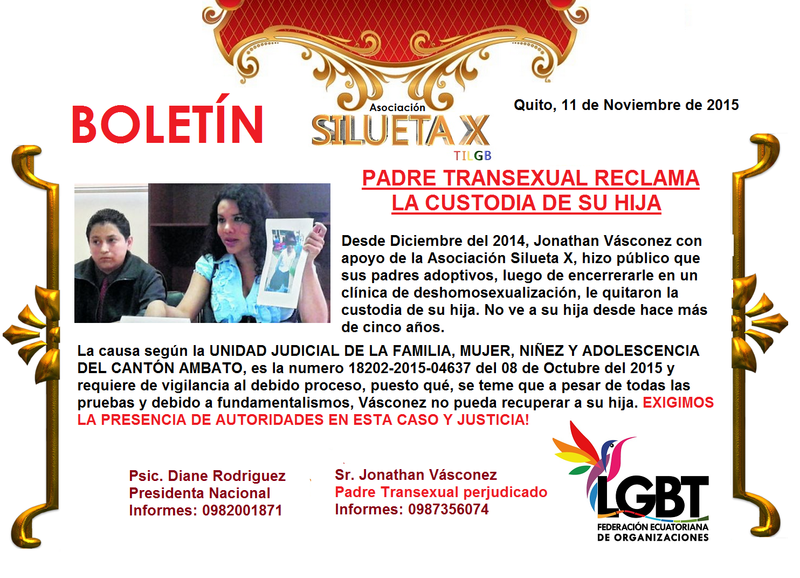 Since December 2014, Jonathan Vásconez with support from the Silhouette X Association, made public that their adoptive parents after encerrerarle homosexualization in a clinic, they took custody of her daughter. He has not seen his daughter for over five years. The cause according to the Judicial Unit for the Family, Women, Children and Adolescents of Ambato Canton, it is the number 18202-2015-04637 of October 8, 2015 and requires vigilance to due process, since it is feared that despite all the evidence and because of fundamentalism, Vásconez can not get his daughter. We DEMAND THE PRESENCE OF AUTHORITIES IN THIS CASE AND JUSTICE!